Catherine Fisher has written some popular YA books, Incarceron and Sapphique which I have not read. Apparently they are brilliant dystopian works of art. I don't know if that's true or not, but I can say that the first book in the Relic Master series, The Dark City, is a very fun middle grade fantasy. I've said often that I'm not a huge fan of fantasy, but that's not true. I actually quite enjoy it when it's written for a younger audience. I'm not exactly sure why, but it's a lovely fit. The Dark City introduces to us Galen and Raffi, who I suspect are the main characters throughout the series. They are relic master and his apprentice. Essentially, I think this means they are magical and have third eyes and can see and sense and manipulate certain objects that also have magical power called relics. But, alas the world they are living in is deeply unfriendly towards them, their capital city has fallen and the Watch has taken over and they try to kill all the Keepers and keep the magical relics for themselves. Galen and Raffi get tricked into making a trip to find some powerful relics in order to get one of their own back. Only Galen has a secret. He had an accident some time back and has lost all his power. Raffi is not yet fully trained so they are vulnerable. They meet a girl along the way who is looking for her lost father..or is she? Can they make it to their destination without being killed? I was pretty easily swept up into this story which was clearly set in an alternate reality and yet not too complex with pages upon pages describing the weird lands and creatures. One thing that was really interesting to me is that the Relic Keepers are framed as the Order..they must pray and have faith even though darkness is threatening to defeat their world. It's interesting to me that created religions and faith systems often play a big role in the fantasy books I stumble across. Is this common? Anyway, completely enjoyed this one, it's the first in a series of books but they all come out pretty quickly this summer so no waiting, yay! Each book will include a piece of the map of Anara, the world of RELIC MASTER, on the reverse of the jacket. Collect all four books and you will have the complete map. 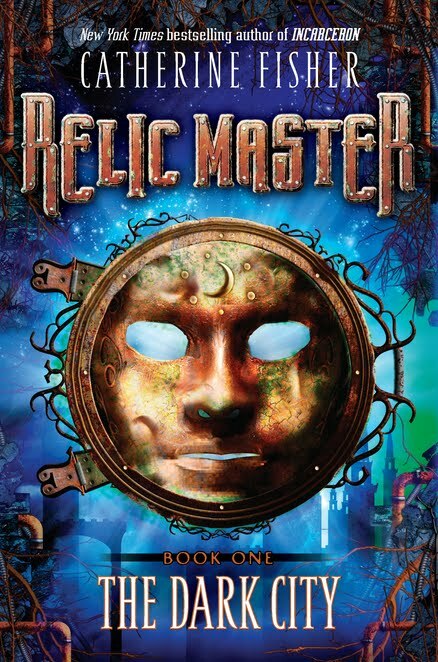 You can learn more about the series by visiting The Relic Master website! Two lucky people will win copies of The Dark City. You must have a United States address to enter. I will choose winners on June 15th. Winners will be emailed.